In a recent article titled 6 Sins of Leadership, the former head of GE Jack Welch asserts that poor leaders lack the guts to differentiate between the star performers and those who are performing at a lower level. He rails against managers who are “unwilling to deliver candid, rigorous performance reviews, …[and instead] give every employee the same kind of bland, mushy, ‘nice job’ sign-off”. Regardless of the profession, it is safe to say that weak and timid leadership is far too common. Despite the fact that most employees crave genuine feedback, and despite the fact that providing that feedback shows that the supervisor is attuned to the operation and cares, far too many supervisors go through the motions if they conduct performance reviews at all. There’s probably some truth in each of these excuses but make no mistake about it, they are excuses. Most of our organizations require annual performance reviews but frequently they’re just artificial requirements. It takes real courage to honestly assess your staff. After all, they are your fellow employees. It takes guts to point out their weaknesses with an aim towards fostering their improvement in those areas. Although most of the time this type of performance evaluation is met with appreciation or at least acceptance, sometimes there will be pushback. There may be icy stares, uncomfortable moments, questions, or outright hostility. However, no one and no organization can improve without honestly assessing weaknesses. Organizations comprised of low performing employees are almost always low performing organizations. The first step in resolving organizational problems may well be recognizing individual problems. An often overlooked drawback of the failure to honestly assess is the effect it has on the “star performers.” These are the people that carry more than their share of the load. They probably don’t need to be told how well they’re performing, but they (and most other employees) appreciate honest, sincere feedback. They too can frequently improve or grow in a new area. However, in an environment where the weaker performers aren’t held accountable, an ineffective manager risks demotivating the stronger performers if (s)he points out a potential growth area. How can a manager sincerely recommend a star performer improve, while totally ignoring flaws in weaker performers? (S)he also demotivates the stars by forcing them to continue to work with weaker performers with no promise of improvement. Sadly, recent research reported in Inc Magazine points out that the poor performers often believe they’re the top performers. They’re not inclined to improve because they have deluded themselves into believing they’re the most essential and productive personnel. By not seriously evaluating their performance, poor supervisors feed that delusion. Worse yet, they make eventually correcting poor performance even less likely by creating a personnel record which, in essence, says the weaker performer is performing just fine. As Welch points out, “lousy managers” think this gutless approach is fair to employees, but in reality it is unfair to everyone. 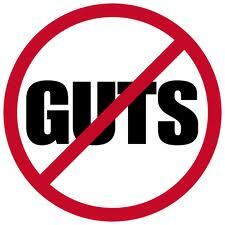 Your employees need you to show some guts and more importantly, so do our students. Posted on September 29, 2013, in Uncategorized. Bookmark the permalink. Leave a comment.